Merv and I took an overnight train to Hospet - 1st class sleeper with A/C and had a room that we shared with 2 other men. Since we never got too friendly and didn’t find out their names, I’ll call them Man A and Man B. Man A had an ipod but didn’t know how to control the volume so I showed him. To return his gratitude, Man A offered us half of his tomato rice, which was quite tasty but way too spicy. I slept quite well despite train motion but Merv woke me up at 6:40am because he saw a many people squatting on the adjacent train tracks doing #2 . Man B woke up as well and was instantly very chatty but Merv and I were too stoned and could only provide single-word responses. When we finally arrived at 8am, we were rudely pushed aside by brown uniformed bodyguards to make way for some governmental VIP, who turned out to be no other than chatty Man B. We missed our chance of rubbing shoulders. 1st class sleeper and brown uniformed bodyguard. In Hospet, we met up with Prem (the Frienemy), who introduced us to his coworker Bel and we all took a big auto rickshaw to quiet riverbank, where you can take a coracle across the river to Anegundi. Obviously, these rides are meant for locals because we don’t speak Kannada so we have to pay Rs10, instead of Rs5. See this bridge? It’s not connected and has been in the exact same state for the past 8 years. 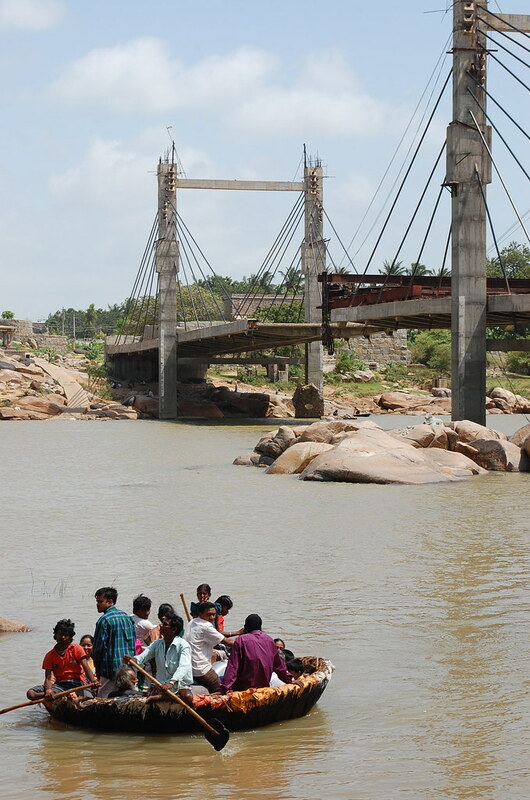 Apparently, some locals are against completing this bridge to avoid big trucks from having easy access to Anegundi villages and damaging the natural environ and heritage. Anyway, the interesting fact about these coracles; there are usually 2-3 paddlers to a coracle and one of said it could fit up to 40 adults or 10 adults with 3 motorcycles. It's like time has stopped here and there’s really no rush for to do anything but live. Life from this side of the river seems so simple and candid; I almost forgot that on the other side of the river, or the world, an era is ending. We checked into Kishkinda Cottage and met the owner, Shama, who happens to also run the Kishkinda Trust. 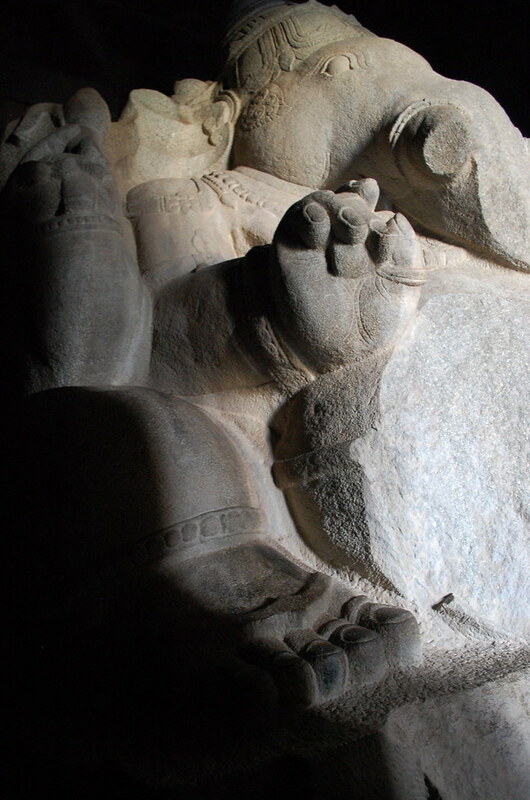 The non-profit organization is dedicated to the conservation of Anegundi heritage. Shama has a certain flair and emits a nurturing-vibe, which makes sense why the villagers call her “amma”. Her niece took us around town to look at some craft workshops that she helped set up and manage. Village ladies learning how to stitch with a view of paddy field. Village ladies making bags with banana leaf fiber. Merv and Prem were bitchy and sarcastic from the hike and heat but both were like me, astonished by the sight. I was surprised how this area hasn’t been guarded off and restored and to my amazement, still in tact. Even though I tried hard looking for "souvenirs", all I found was some shells. Wait a minute, what are shells doing on the hilltop? Apparently, up on these hills is where land used to be, so these shells I found could be ...5000 year-old fossils? People I know who visited Hampi covers Hampi in two days but since we spent a chunk of this weekend in Anegundi, we pretty much scurried through these sights like a marathon runner. 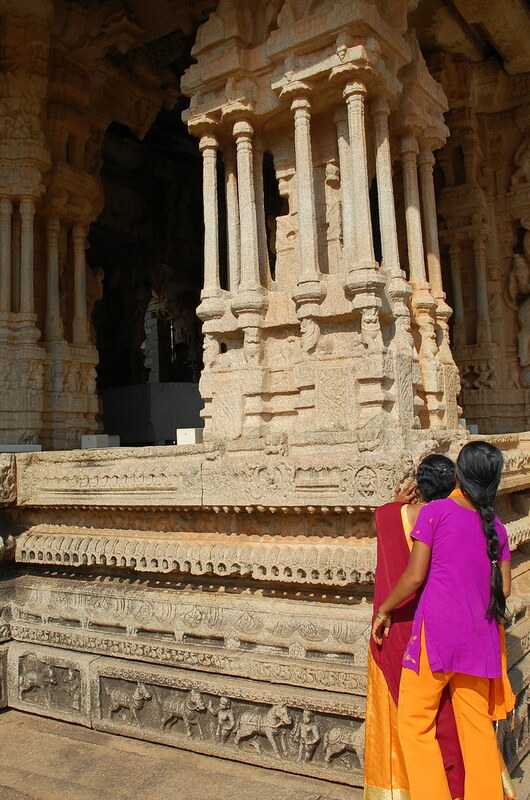 The architecture of the Hampi ruins reminded me so much of the ruins I saw in Greece, it made me wonder who copied whom? Hampi is really peaceful and beautiful, check out my flickr album for more pics. After an 11-hour train ride, we reached Bangalore at 6:30am and Prem got a call from Bel. How sweet is that? A check-in call once you reach your destination. When Prem got into work, Bel explained that someone had saw on the local Hampi news that three engineers had drowned , one of them from Chennai (Prem always claims he’s from Chennai but dude is born and raised in New Jersey) and Bel was convinced that it was the three of us. There were no cell phone reception on our overnight train from Hampi to Bangalore, so he couldn’t reach Prem. Bel even called my office and found my cell number but it was my U.S. number, which doesn’t work locally so he was freaking out. Poor Bel must’ve had a long sleepless night and it’s unfortunate the 3 engineers died but we thought the whole situation was quite funny.